1. Central Visayan Conferences: No. of churches totally destroyed — 94 and partially destroyed – 37; No. of SDA families affected — 1,983. Adopt a Minister International has adopted ministers working in Leyte, Samar and Panay (affected areas) and so far, everyone is safe. 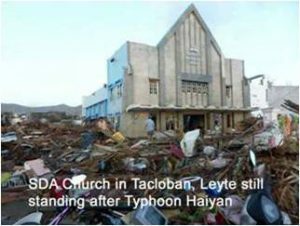 The Seventh Day Adventist Church in Tacloban had water up to the roof but it is still standing (please see picture). The majority of SDA churches there are simple buildings and worth less than $3,000 to $5,000 per building so many are gone. The East Visayan Conference building was engulfed by seawater up to the ceiling of the second story. Those who sought shelter at the conference building are OK, but one worker and his wife drowned. Three days later, they were found dead, hugging each other. Another sponsored pastor wrote this morning, thanking me for transferring him and his family to another island. 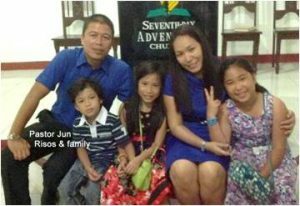 He found out that their house in Tacloban is gone – washed away by the flood waters. A couple, their best friends drowned when the 20 ft. wall of water had come in. Their two children are safe because they were sent to away to stay with their grandmother in another place. I do not know the number of Adventist churches leveled down yet. I am sure in the hundreds. So many brethren lost their homes. I do not know how many of our brethren had perished. 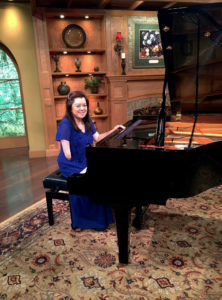 There is one good thing about this – calamities make people accept the ‘good news’ of Salvation. Jesus is coming very, very soon. It will take a very long time for the typhoon victims to get their lives back to normal. The Philippine government is feeding 1.4 million people everyday and for how long, I do not know. These people had lost everything – houses, jobs, and many had lost loved ones. The majority of the people there are so poor. Before the typhoon, the average ‘take home’ wage of the poor was $1.25 per day so you can just imagine how much it is now, if any, after Haiyan. Any donation that we will receive will help Adventist brethren in very isolated places (very small islands) where international help may not go. We have adopted ministers who are taking food and water to these places. Your donation will also help an adopted minister who lost his small nipa hut. The typhoon made its 6th landfall in the island of Palawan. This place had only wind and rain. A tree toppled over and destroyed the adopted minister’s hut. Thank God, the little family (with a 10-month-old baby) was able to get out of the house before the tree fell. They found refuge at a neighbor’s house. I was a total wreck last week after the typhoon. I couldn’t sleep and I cried for two days. I tried not to look at typhoon images but ended up seeing every picture on the Internet and on TV anyway. It will take a very long time to erase the horrible images from my mind. The Filipino people are so used to typhoons; they did not have any idea there was going to be a 20 ft. wall of water coming at them. They are saying now that it was a tsunami and not a storm surge because before the wall of water came, there was an explosion (in the ocean) and the seawater receded half a mile into the sea – typical of a tsunami. Thank you for asking about the damages that Typhoon Haiyan did to our Adventist brethren in the Philippines.